Purchasing a diamond is a significant investment, and for over 25 years, we at Schmidt’s Jewelry have been building a rock solid reputation of selling high quality, Ideal Cut diamonds at affordable prices. Schmidt’s will ensure you are getting the diamond that will express your individual taste and style. The non-commissioned staff here at Schmidt’s Jewelry will assist you in a relaxed, non pressured environment. At Schmidt’s, we believe that the cut of a diamond is one of the most, if not the most, important quality that a diamond posses. We allow you, the customer, to view your diamond under the gem scope to inspect the quality of the diamond, and offer near Ideal Cut and Ideal Cut diamonds, again ensuring that your diamond is exactly what you are looking for. Diamonds are not the only thing we provide here at Schmidt’s. We specialize in making custom designed jewelry. Bring your ideas in, and we will work with you to create that perfect piece, or bring in your family heirloom and renew the brilliance by changing the mounting or add new stones. We are one of the very few jewelers in the Tri-State area that offers in-store colored stone repair and restoration. We have one of the largest selections of bridal jewelry in the Fargo-Moorhead area. 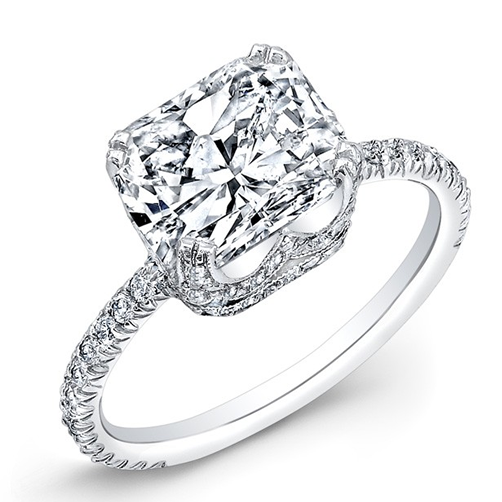 We are confident the ring you are looking for is in stock, or can be custom created just for you. We take pride in our workmanship and the quality of our product. Your dollars spent here stay in the community and not sent off to support a franchise. You can park at the front door and not have to fight the mall crowds and traffic. We have a friendly, relaxed atmosphere without high pressure sales personnel. All of our repairs and custom work are done at the store and not sent anywhere. Know the gift you give from our store will be as unique as that special person in your life. You won't get snowballed on prices.